"Works with any cut of meat, but recipe listed is for chicken. Two-pound cuts work best. Given to me from my aunt!" 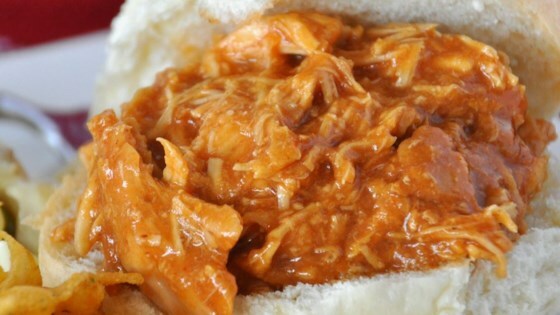 Shredded slow-simmered chicken in a tangy homemade BBQ sauce. For best results, after 6 hours of cooking, make another batch of the BBQ sauce, pour over shredded chicken and stir; cook another 1/2 hour until finished. Delicious! I reduce the maple syrup to 1/4 cup and add 1/4 cup of Sweet Baby Ray's Hickory and Brown Sugar BBQ sauce for a little bit of smokiness. This recipe was just.....ok. It was a little on the sweet side. If I make this again, I might use less maple syrup. I also added one chopped onion to the mix. This really was quite tasty...I rolled up the shredded chicken in warm flour tortillas...kids loved it! Serve along with a crisp green salad and dinner is on!